In Part 1, we setup the projects necessary for a standard business application using IdeaBlade DevForce for the Model, MVVM Light for the ModelView and a Telerik RadGridView in the View. In Part 3, we will follow through the binding process to see some of the challenges posed when making the grid editable. In Part 2, we will make the changes necessary to make the grid editable. Show Orders in the Rows of the Grid. Save changes to the Orders with a Save Changes button. This will require adding an Orders property to the MainViewModel; populating that property and then binding the Orders property to the grid. Make sure there is a reference in the Web project to the server-side Model project. Use the mvvminpc Snippet to add an Orders property. /// The <see cref="Orders" /> property's name. /// Gets the Orders property. Next, add a method to fill the collection. Build and Run. After a moment or two, you should see the grid, fully populated with Orders. For once, the default behavior is desirable. We get this for free because the RadGridView is editable by default. Due to the magic of Binding, the Order objects are getting updated whenever a cell in the grid is edited. Saving those changes will require us to have a button bound to an ICommand that will tell the EntityManager to save all the changes. In MainPage.xaml, add a button to the StackPanel above (or below) the RadGridView. In MainViewModel.cs, add a new RelayCommand named SaveAllCommand. Build and Run. After a moment or two, you should see the grid, fully populated with Orders. Try editing some of the orders and hit Save All. Refresh the page to see that the changes were saved. So now you have an editable grid. So far, we have not needed the RowViewModel. If you only want SaveAll functionality, the default behavior of the grid will suffice. The grid lets you edit any cell all the time and the bindings keep the model up to date. A simple call to entity manager to save the changes and all is well. However, if you want some entity specific functionality, you will find it quite cumbersome to try to deal with this within the context of the grid’s ViewModel as it is really only concerned with the grid and entire grid related actions (such as Save All). In Part 3, we will add some entity specific requirements so we can see how to use the RowViewModel to make working with the entities in the grid much simpler. In my earlier post here, I introduced the concept of a RowViewModel to make editable grids using the MVVM pattern. In this post, I will demonstrate how to implement the RowViewModel using a combination of IdeaBlade DevForce for the Model, MVVMLite for ViewModel support and Telerik’s Silverlight RadGridView for the View. IdeaBlade DevForce 6.0.7 or later. Telerik Silverlight Controls 2010.3 or later. We’ll use IdeaBlade’s sample database: NorthwindIB. This can be found in the \Program Files\DevForce 2010\ folder. I have way too many VS add-ins installed so my screen shots may not appear as your screen does. I do use JetBrains Resharper and Telerik’s JustCode, so some of the refactorings and shortcuts may not be available if you do not have these tools. Then add the DevForce Silverlight Application project. Rename the project with SL suffix. Do not rename the Assembly with the SL suffix and do not change the namespace. 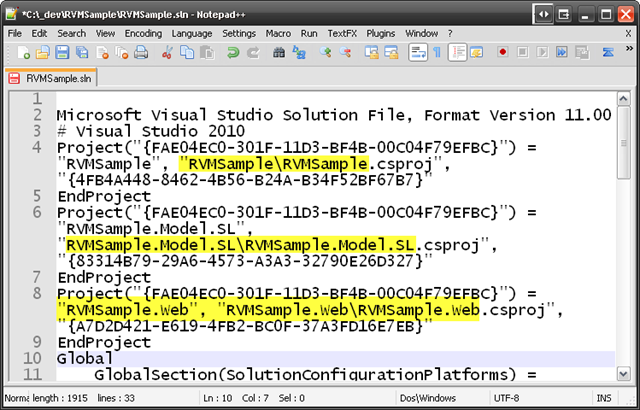 Add references to the DevForce assemblies referenced in the Model project. 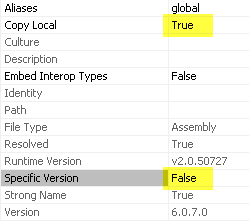 In the properties for the DevForce assemblies, change the Copy Local to True and the Specific Version to False. Rename the web project to remove the word Model. Rename the Assembly and the namespace. On the Silverlight Applications tab, remove the dead DevForce Silverlight app project (if present). Add the Silverlight Application (e.g. 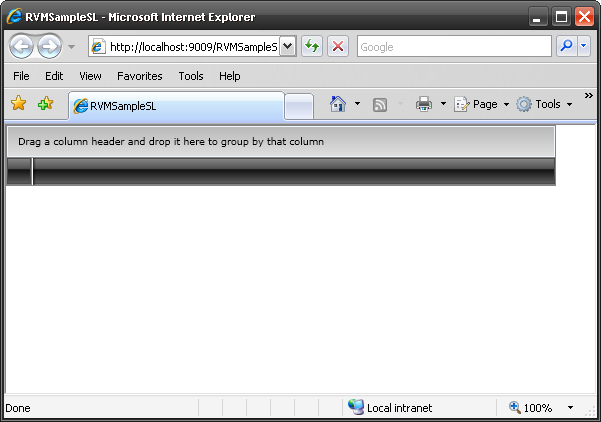 RVMSample). Delete the test HTML page and the Default.aspx page. Set the Web project as the Startup Project. Set the new test ASPX page as the Start Page. Delete the XAP file from the ClientBin folder. Save and Close the solution. Rename the project folders to match the project names. Edit the .SLN file in a text editor to correct the folder names there too. Open the solution in VS. So far so good. We have setup the three-project solution. Unfortunately, this means we’re going to load the EDMX into the Web project, which hardly seems fitting. Let’s create a server-side project to house the server side Model. Add a regular Class Library project as the server side Model. This should be named application.Model. In the Web project, add a reference to the application.Model project. Add an ADO.Net Entity Data Model name it NorthwindIBModel. Select to Generate from database. Connect to the NorthwindIB database. Change the namespace to application.Model. Wait while the Entity Manager and IdeaBlade do their code generation. IdeaBlade will also make a link from the Model.SL project to the Model project so they share code. Copy the new connectionString settings from app.config in this project to web.config in the web project. Great, now we have client-side (Model.SL) and server-side (Model) model projects, a Silverlight application project and a Web project to host it all in. Let’s go ahead and add the Telerik Grid to the project, then we can finally start looking at the Row-View-Model pattern. In the application project, open the MainPage.xaml. Change the Width and Height of the page to 1000 x 800. Remove the TextBlock that is there. Change the <Grid> to a <StackPanel>. In the <StackPanel>, drag and drop a Telerik RadGridView from the Toolbox. Change the Width and Height of the RadGridView to 1000 x 800. Build the solution to make sure all the references are configured properly. Ta da! All that work to set up the beginning state for exploring RVM. In my next posting, you will get the requirements for the grid and see how we can use the RowViewModel to make in-line grid editing much simpler. Of course I had to adjust the connection string in the ModelEF’s app.config file. 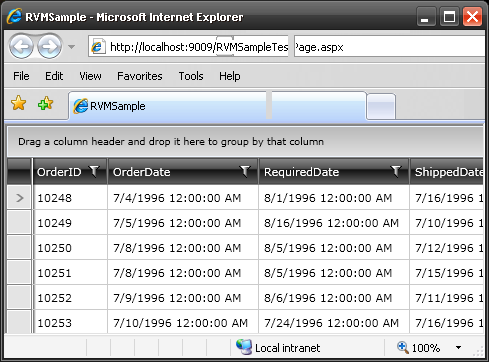 The SQL to create the tables is in the Step 1 instructions linked above. I have not included the DLL’s and Installs in the dependencies and installations folders. These can be readily downloaded from the various vendors’ sites. We need to create an Enterprise application that is web-based, has an Excel-ish interface and pulls data from an Oracle database. * See here for our reasoning. Install IdeaBlade’s DevForce for Silverlight tool. There will be two DevForce model projects, one will be a C# library project that runs on the server, the other will be a Silverlight library that runs in the Silverlight client. The DevForce framework takes care of wiring these two together with a couple of WCF services that are hosted in the Web application that hosts the DevForce components and the Silverlight app. Open the Entity Framework model solution created in Step 1 of this walkthrough. DevForce naturally works with EDMX files (Model | Add Entity Model), but we have an EDML file from the devArt Entity Developer, so we have to use File | Open to get to it. Select File | Open, change the Files of type to All Files. Select the Model_Widget.edml file and click Open. At this point, DevForce has opened the EF model. Now, we have to tell it how we want the projects to be configured. 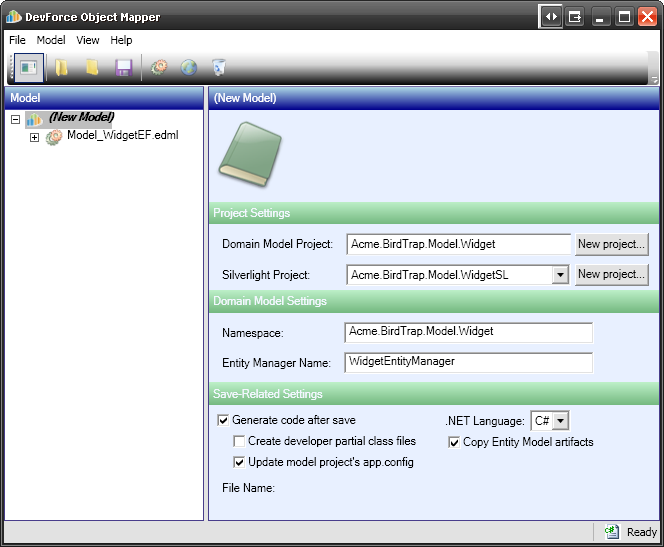 First, click the New Project button for the Domain Model project. The Project Name needs to follow our assembly naming convention, so for this walkthrough, I am using Acme.BirdTrap.Model.Widget (with no suffix). I will leave the Project Type and Location at their defaults. Second, click the New Project button for the Silverlight project. The Project Name needs to follow our assembly naming convention, so for this walkthrough, I am using Acme.BirdTrap.Model.WidgetSL (with the SL = Silverlight suffix). Set the EntityManager name to something more model specific, we use a standard of ModuleEntityManager as the application may need to work with multiple modules’ EntityManagers at the same time. I have selected to name the Entity Manager: WidgetEntityManager. Select the Model_WidgetEF.edml branch of the Model tree on the left. You will see the settings available for this EF Model. Change the DataSourceKeyName to something more model specific, we use a standard of ModuleDataSource as each module/model needs a different DataSource definition. The name pluralizer is a great feature of DevForce but it is completely irrelevant to us as devArt’s Entity Developer tool has taken care of pluralization for us. Click the Save button on the toolbar. DevForce will now create and initialize the two projects we have defined. When it has finished, close the DevForce Object Mapper. Next, we need to create the BaseEntity class we added to the Injected Base Types earlier. In the new Silverlight project, Acme.birdTrap.Model.WidgetSL, add an Existing Item, then navigate to the BaseEntity class you just created in the C# project, drop down the Add button and choose Add as Link. I bet you wish we were done at this point. We are not. DevForce made some assumptions in generating the projects that we need to fix. First, and really only a cosmetic issue, DevForce created a Solution Folder for the DomainModel. You can choose to keep this or not. This whole solution is for my DomainModel, so I do not need this new folder. If I incorporate the Model projects into a larger Module level Solution, then I will use a Solution Folder for the Model projects in that solution, but I do not need one here. To remove the folder, I drag the two new projects up out of the folder into the Solution level and then Remove the folder. Second, and by far more serious, DevForce pulled in a bunch of referenced components, some of theirs, some of the .Net Framework’s and some from the Silverlight SDK. Examining the C# project (Acme.BirdTrap.Model.Widget), we find the IdeaBlade assemblies are referenced from Program Files. We can change that by: first, removing the Ideablade.Core, Ideablade.EntityModel, Ideablade.Validation,assemblies; then adding them back from the dependencies\IdeaBlade DevForce\ folder. Examining the Silverlight project (Acme.BirdTrap.Model.WidgetSL), we find the IdeaBlade Silverlight assemblies are referenced wrong, which can be corrected as above, only adding back from the dependencies\IdeaBlade DevForce\SilverlightAssemblies folder this time. However, we also find that the System.ComponentModel.DataAnnotations assembly is being pulled from \Program Files\Microsoft SDKs\ folder. Remove it and add it back from dependencies\Silverlight\Libraries\Client\. That’s it, right? We’ve created the files and all is well. If you try to Build your solution right now, you will get errors originating from the EF project. But it was fine before we started, and we didn’t change it — or did we? In fact, we did. When you point the DevForce Object Mapper at the EF project’s EDML file, DevForce adds a bunch of attributes to some of the elements in that file. In doing so, the DevArt Entity Developer notices the EDML has changed and wipes the generated *.designer.cs file. To restore this, you need to re-open the EDML file and regenerate the generated code. But here’s the rub, if you open the EDML file from within Visual Studio, the devArt Entity Developer will only regenerate the code if you make changes to the model. But we don’t want to make changes to the model. Clicking this button, will regenerate the missing generated code without requiring a model change. You can then exit the Entity Developer. In this part of the walk through, we have created the pair of DevForce C# and Silverlight projects that contain our Domain Model. The solution successfully Builds and the EF unit test we created in Step 1 still passes. Now we need to create a pair of Unit Test projects to ensure that the DevForce framework is configured properly and can successfully CRUD the database through the EF layer. But that will have to wait until the next part of the walk through. Until then: I’m off to take the dog for a walk! Woof! I know the world is about to change in April when VS2010 goes live, however, we are still using VS2008 and will be for at least a few more weeks. In the hopes that this walk-through provides some insight to someone, even if it is just me, here goes. Web development is not nearly complex enough, so we sought out a unique challenge involving the newest, least documented, voted most-likely-to-be-completely-re-done-in-the-next-version technology (excepting WWF, I mean, WF, which will probably hold that distinction for years to come). Management is opposed to fat client or virtualization, so the app has to be web-based. After much trial-and-error, and trial-and-failure, and trial-and-compromise, we deployed an ASP/Ajax solution that was less than satisfactory and not-at-all Excel-ish, so we had to find a “better way”. None of us had ANY desire to explore Flex. We are a Microsoft shop, so building a Java app was not really an option. Having worked with Hibernate, NHibernate, and SubSonic (which I preferred over NHibernate), I was convinced that a Data Layer / ORM would make our application specific code much easier to write and would provide more and better infrastructure/plumbing than we ever could. Having been exposed to DevForce Classic a few years ago, I knew their product provided much of what we needed, and they were on the cusp of releasing a Silverlight version of their WPF framework. As an added bonus, their documentation, and Ward Bell’s blog, are highly readable and provide excellent project guidance and design philosophy. DevForce sits on top of Entity Framework, which does not support Oracle, but as this was about to kill the deal, we found that DevArt’s Oracle drivers were finally supporting EF properly. If you’re gonna do this thing, you might as well go all in. Having worked with CAB for a Windows App, I understood the potential of a component based application framework — or at least imagined I understood it, can anyone really understand anything PnP publishes? After dabbling in the Java world for a few months, I had developed an appreciation for Spring, Dependency Injection, configuration over coding and convention over configuration. I am unrepentant about preferring Agile development practices, and many of the “best practices” prescribed by PnP and implemented in Prism, represent many Agile coding principles in action. Both VersionOne and RallyDev have Agile 101 documentation on-line. Mike Cohn has written several excellent books introducing teams to Agile practices.